Year 8 girls travelled to Newry Hockey Club on Wednesday 9 April to participate in a 8 aside round robin tournament involving Newry High, Aughnacloy College and City of Armagh High. The girls were crowned champions as they finished top of the group. Special mention must go to Jenna Corkey (pictured right) who scored 4 goals in the 3 matches and also to goalkeeper Jessica Acheson who played impressively throughout. Well done to Coach Miss L Anderson and her winnng team of: Jessica Acheson, Emma Louise Bailie, Jenna Barbour, Rachel Belshaw, Emma Cooke, Jenna Corkey, Alyson Henry, Judith Leeman, Amy McIlveen, Jessica Smyth, Kelly Ann Smyth and Jorja West. Pictured above are Emma Louise Bailie and Jenna Corkey with the trophy won at the recent tournament at Newry Hockey Club. Year 12 Maths pupils travelled to Queen's University Belfast on Friday 11th April to take part in a careers afternoon organised by the Maths and Physics Department in the university. Pupils had the opportunity to speak to a number of professionals who had graduated with a degree in Mathematics and ask questions about their careers. The Mathematics graduates explained the Mathematics involved in their jobs and how they use the content of their degree in their career. 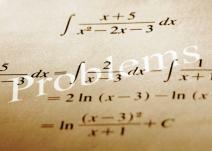 Year 12 pupils at Newtownhamilton High School achieved 3 Gold, 3 Silver and 6 bronze awards in the 2014 UKMT Intermediate Maths Challenge. Over 200,000 pupils from across the UK sat the Intermediate Maths Challenge with roughly the top 6% achieving a gold certificate, the next 13% silver and the next 21% bronze. Pupils who achieved a gold certificate were Deborah King, Elizabeth Blackwood and Nicole Barbour who was also awarded the Best in School certificate. Well done to all involved. The community came out in force last night as a packed house watched the Spring Variety Concert that was run by our School Association. The evening included a wide variety of acts featuring the talents of pupils, parents and staff. There was also a few laughs on the night with compere Mr Willie Hughes contributing. A massive total of over £1800 was raised for school funds and so a big thank you must go to our committed School Association Members, Music Teacher Mrs L Graham, all the performers and finally those who helped back stage to make this event such a success. Pupils have been rehearsing today with Music Teacher Mrs L Graham for the Spring Variety Concert on Thursday (10th April) evening. The practices have been impressive with the concert also including acts such as Aughnagurgan Accordian Band, Ulster Scots Dancers and the highly popular Newtownhamilton Young Farmers. Meanwhile, our School Association Members have also been working hard behind the scenes to ensure that things will go smoothly on the night. All families were issued with 2 tickets recently. Parents are reminded to either return the tickets or payment. Payment at the door on the night will also be accepted with doors opening at 7.00pm. Everyone Welcome. These sessions reinforce work that was previously covered during class and also focus on improving examination technique therefore all Year 11 & 12 GCSE Maths pupils are advised to attend. Further information can be obtained from Miss V Hadden. 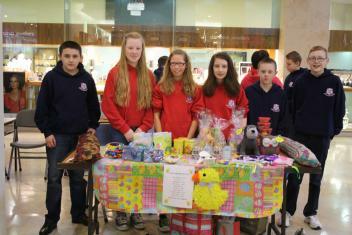 Year 9 students attended the annual ‘Cross Border Trade Fair’ in the Marshes shopping centre, Dundalk on Friday 4th April with their LLW teacher, Mrs Flanagan. 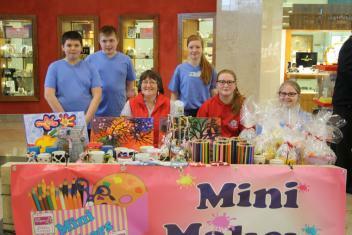 The students sold homemade arts and crafts as well as Easter treats to eager shoppers, and returned victorious with a healthy profit! This has been an invaluable experience for all year 9’s as they have developed excellent entrepreneurial skills as well as gaining an insight into the ‘real business world.’ Well done to everyone who contributed in this scheme! 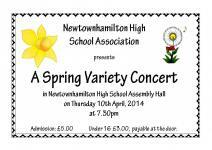 Newtownhamilton High School Association will be holding a Spring Variety Concert in the Assembly Hall on Thursday 10 April 2014 at 7.30pm. 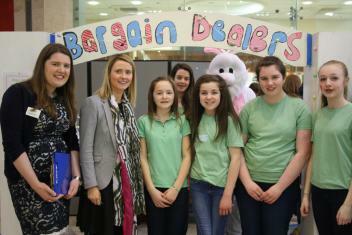 The evening will feature a variety of acts involving pupils, former pupils, association members and staff. Parents and friends of Newtownhamilton High School are encouraged to support this event. Tickets can be purchased by contacting the school office (02830 878246). Everyone welcome to come along and view the talent that exists in Newtownhamilton High. 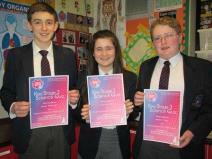 Year 10 pupils recently hosted a question and answer session with local Councillor David Taylor (UUP). 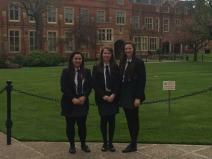 Pupils were able to ask the politican about local and global issues that they felt needed to be addressed. Topics such as career opportunities for young people and the issues over the quality of the roads in South Armagh were debated. Pictured below (left to right) are pupils Judith Leeman (Dorsey), Alyson Henry (Fane) and Jack McKnight (Whitewater) with Principal Mr G Mullan following morning assembly today. These pupils were presented with Easter Eggs for receiving the most housepoints in the respective houses since November 2013. Congratulations! More information on our School Houses can be found by clicking here. Important dates for the Duke of Edinburgh's Award Scheme are now available. Please follow the link below to find out more. On Friday 21 March, a team of Year 10’s from our school entered the Key Stage 3 Science Quiz which took place in St. Patrick's High School in Keady. 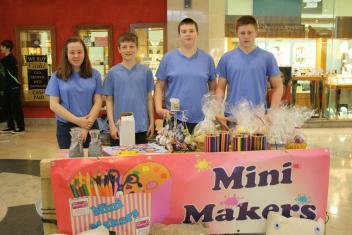 Sixteen schools participated in the annual event which runs during National Science and Engineering Week. Our team made a great effort through 10 hard fought rounds – well done to all those who participated!